Astronomer Ian Ridpath (right), a key investigator into the December 1980 Rendlesham Forest UFO incident, lead myself, Today presenter Evan Davis (centre) and producer Jonathan Harvey deep into the pine woods for what almost became the Blair Witch UFO project. Cue lots of fast walking and talking on what was a very enjoyable, and informative, adventure. As we emerged at the other side of the plantation, Ian showed us the dazzlingly bright Orford Ness lighthouse which he believes is at the centre of the second night’s sightings, made famous on the recording by Colonel Charles Halt. I’ll admit that I was never entirely convinced by the lighthouse explanation, but having seen it for myself, I think it makes absolute sense. As Ian points out, even the timing of the USAF men’s gasps at the light on the tape matches the lighthouse’s periodic rotation. I’d suggest that anyone who can get there spends an hour or so in the dark following the path through the woods taken by the USAF witnesses and relives the experience for themselves. Not only might you gain an understanding into the December 1980 event itself, but it’s a lot of fun: Rendlesham Forest can lay claim to being Britain’s greatest, and only, UFO-experience adventure park! So the real mystery at the heart of the Rendlesham incident is not the cover up of a UFO landing, but how men guarding a then-secret nuclear stockpile capable of destroying half of East Anglia could so easily be panicked into total confusion. It has been nearly 30 years since Britain’s biggest UFO incident, when a security patrol of US service men based at RAF Woodbridge spotted strange lights moving through the trees in Rendlesham Forest. 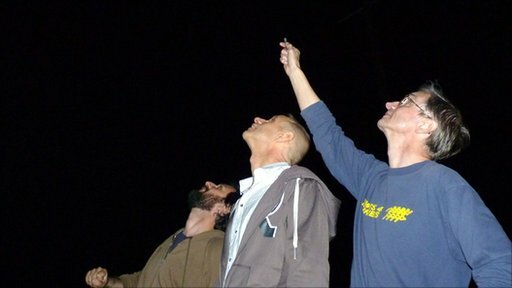 Evan Davis visited the woods at night with author Mark Pilkington and astronomer Ian Ridpath to see what he could find. This entry was posted in Culture, History, UFO. Bookmark the permalink. The Ridpath lighthouse theory stinks. If we believe that, then we are saying that Col Halt and his men were fooled not once but on consecutive nights by a lighthouse? It makes no sense. And how do you account for the reports of a landed object that took off and divided into seperate objects in the sky? I really don’t buy this line of thinking at all. Obviously, no one would be go into “total confusion” over the emanations from a lighthouse. But something completely unfamiliar may well have triggered such a reaction. Halt has also, more recently, said that the UFO probed the nuclear stockpile, something that had not been revealed before. Could a lighthouse do that? Could a lighthouse appear landed as a solid object in front of numerous witnesses? That theory is up there with the bloke who said he’d hoaxed it with his car lights. Thanks mate, you’re only three decades late. Exactly the same objects seen by Penniston, Buroughs and Halt was seen by my cousins and three servants in a rubber plantation in Kerala, India in 2008. The object was red triangular and it seemed to move easily between the trees. It was about ten feet tall they said. The dogs were howling when it first saw them, then became scared and silent. A small red orb about a foot or two , with spikes or stuff dripping from it came very close to them and then dissapeared in a blink when they approached it. These people never ever heard of the Rendelsham forest incident. Too many similarities in both the incidents.